You’ve never taken on more debt than you can afford, and you always pay your bills on time – so your credit must be great, right? Not necessarily. Credit scores don’t consider debt-to-income ratios and they take into account many factors beyond just timely payments (although those are extremely important). Pure and simple, having a good score today is critical for financial success. It gets you access to lenders’ best rates and terms, which can save you thousands of dollars each year. At today’s rates, for example, the total interest owed on a $300,000 mortgage would cost an extra $14,000 for an individual with a credit score of 759 rather than 760, according to myFICO.com. An extremely poor score can make it impossible to get a loan to buy a house or a car in the first place. 1. You run up a large balance on your credit cards (even if you pay it off every month). After timely payments, the most important factor on your credit report is your credit utilization ratio – the percentage of available credit that you’re using on your credit cards, both individually and in sum. “Having a high credit-utilization ratio can be just as damaging to your report as missed payments,” says John Ulzheimer, a credit expert at CreditSesame.com. Aim to keep that ratio below 20 percent to 30 percent. The higher the ratio, the worse it is for your credit score, regardless of whether you’re up to date on payments. If you charge everything on one card – for convenience or to rack up rewards points – and then pay off everything when you get your bill, you may still be doing damage to your credit score. Most credit card companies report the balance due at the close of each billing cycle. So if you owe $900 on a card with a $1,000 limit, your utilization ratio on that card is 90 percent, even if you pay the balance in full the day you receive your bill. To keep your score as high as possible, go online and pay your card before the closing date, rather than wait for the bill to come in the mail. Or, if you think your utilization on one card is creeping up too high, switch to cash or another card mid-month. 2. You assume your spouse’s credit actions have nothing to do with yours. Though the credit bureaus keep separate scores for spouses, the actions of your better half can still impact your credit score. Any joint accounts or loans factor into both of your credit scores separately – so if one spouse fails to pay bills on time, or likes to carry a high credit card balance, the other spouse’s credit score will likely take a hit. “Any joint account will appear on both of your credit reports, and the payment history is counted as if it’s your own, whether or not you use it,” says Gerri Detweiler, director of consumer education at Credit.com. Some married couples opt to put all credit card accounts and loans in one spouse’s name. The problem is that it leaves one partner with a huge gap in his or her own credit history. In the event of a divorce or death, it could be difficult for that person to access credit on his or her own. 3. You close or open several credit card accounts at once. Some consumers mistakenly think that closing down credit cards they rarely (or never) use will boost their score, but the opposite occurs. Closing down accounts will decrease your total amount of available credit, which will automatically push up your credit utilization ratio. In general, there’s no reason to shut down old credit cards unless they carry a high annual fee. One other tip: Don’t open any new accounts at all within three months of applying for a mortgage. 4. You co-sign a loan for a friend or family member. Co-signing a loan or a credit card for someone else is one of the most dangerous things you can do in terms of your credit score. Why? The status of that loan will appear on your credit report. If your co-signee makes a habit of paying late or carrying a high balance, that can negatively impact your score, and there’s no requirement for the bank to inform you about it. 5. You don’t check your credit reports on a regular basis. You’re entitled to get each of your credit reports for free once a year. 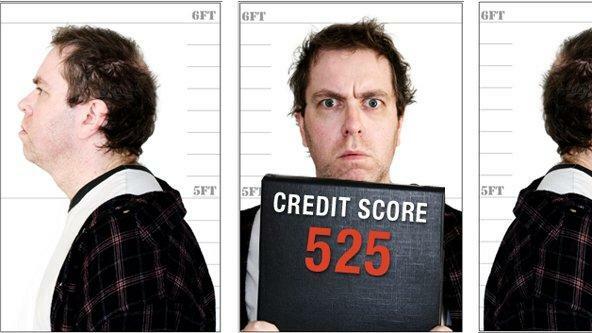 Experts suggest pulling one every few months through annualcreditreport.com. “Your credit report will immediately show your credit history, including what you’re doing right, what you’re doing wrong, and what areas you need to focus on,” says Rod Griffin, director of public education with Experian. Checking your report will not only give you insight into which areas of your credit you may need to improve – it will also ensure that any newly introduced errors get quickly corrected. A report last year by the Federal Trade Commission found that one in four credit reports contained an error that might affect the subject’s credit score.